Heliophanus – Wiki der Arachnologischen Gesellschaft e. V.
Heliophanus aeneus × × × × × × × × × × × × × × × ? Heliophanus agricola × × ? Heliophanus apiatus × × × × × × × × ? Heliophanus cupreus × × × × × × × × × × × × × × × × × × × × × ? Heliophanus cupreus cuprescens × ? Heliophanus cupreus globifer × ? Heliophanus dampfi × × × × × ? Heliophanus decoratus × × ? Heliophanus dubius × × × × × × × × × × × × × × × × ? Heliophanus dunini × × × ? Heliophanus edentulus × × × ? Heliophanus encifer × × ? Heliophanus equester × × × × × × × ? Heliophanus flavipes × × × × × × × × × × × × × × × × × × × × ? Heliophanus haymozi × × ? 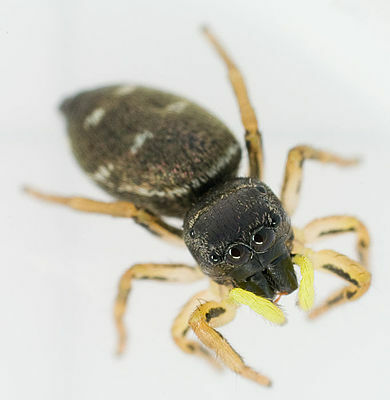 Heliophanus kochii × × × × × × × × × × × × × × × × × × ? Heliophanus melinus × × × × × × × × × × × × × × ? Heliophanus mordax × × × × ? Heliophanus patagiatus × × × × × × × × × × × × × ? Heliophanus patagiatus albolineatus × ? Heliophanus ramosus × × × ? Heliophanus rufithorax × × × × × × × ? Heliophanus simplex × × × × × × × × × × × ? Heliophanus tribulosus × × × × × × × × × × × × × × × × × ? Diese Seite wurde zuletzt am 5. April 2017 um 13:10 Uhr bearbeitet.